The Indian Motorcycle Company began in 1901, the creation of engineer Carl Oscar Hedstrom and bicycle racer George Hendee. It did not take long for the Indian to be recognized for its revolutionary designs. The company won a Gold Medal for Mechanical Excellence at the St. Louis Exposition in 1904. 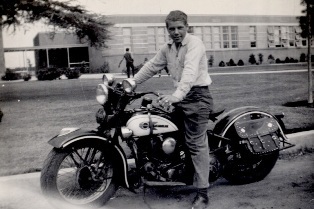 Just two years later, two men rode an Indian motorcycle from New York to San Francisco. It took 31 days, which shattered the previous record of 49 days. In 1907, and Indian Twin won a 1,000 mile Reliability Trial in Britain, and the forward-looking New York City Police Department bought two Indian Twins for the purpose of chasing down runaway horses. By the time World War I loomed, there were at least 20 American motorcycle manufacturers vying for business. At that time, Indian had more than 40% of the market share. They couldn’t make the bikes quickly enough to satisfy demand. In the 1920s and 30s, Indian still dominated the American motorcycle market. The super popular Scout came out in 1920, and by 1923, the Chief and the Big Chief followed, to great fanfare. Even though the Great Depression hit in 1929, Indian was bought by E. Paul DuPont, a great boon in an era when nobody knew just how bad the economy would be hit. Indian Motorcycle Company adopted some of the Art Deco touches of the 30s, with pin-striping, decals, and two tone designs. The lightweight Motoplane and Pony Scout rolled off the line in 1932. A Sport Scout, ridden by Ed Kretz not only won the 1937 inaugural Daytona 200, it also lapped the entire field. But as World War II approached, Indian turned to the task of supplying the War Department with motorcycles. In addition, France ordered 5,000 Chiefs fitted with sidecars. Though production and repair services were at a fever pitch during the early 1940s, and the economy was recovering from the problems of the 1930s, Indian was not prepared for the changes that would take place after the war ended. By 1945, the company was sold, and in 1950 it was split into two parts: one for manufacturing and the other for sales. In 1953, Indian went out of business altogether, but fights over the ownership of the trademark lasted until the end of the 20th century. Indian was revived in 1999, but went out of business again in 2003. The latest incarnation of the Indian Motorcycle Company began in 2006 and now operates from a manufacturing facility in Kings Mountain, North Carolina.